SOCHI, Russia (Kyodo) -- Baseball and softball's potential return to the Olympic program for Tokyo 2020 got a major boost on Wednesday, receiving the backing of Olympic Council of Asia President Sheikh Ahmad Al-Fahad Al-Sabah. Sheikh Ahmad, the Kuwaiti powerbroker who is said to have pulled strings for Tokyo's 2020 bid and Thomas Bach's campaign for the International Olympic Committee presidency, said he sees no reason why the two sports shouldn't be allowed to return if all the relevant parties want them back. On Monday, IOC President Bach said the rule forcing a sport to wait seven years before gaining entry to the Olympics is outdated. The German has also said he wants more than the current maximum of 28 sports. Given his influence not only in Olympic circles but in the entire sporting world, Sheikh Ahmad's support will be massive for baseball and softball, arguably even bigger than Bach's vote of confidence. "As a person who knows the NOCs, as (Association of National Olympic Committee) President, I think this part of the world, baseball and softball mean a lot," Sheikh Ahmad said. "It will be added value for the sport, added value for the marketing and added value for the spectators." "For that, I fully support baseball and softball to return for the Tokyo Games in 2020. In East Asia, baseball and softball are one of the main sports they have." "A lot of athletes ask the million-dollar question: Why are we not there?" 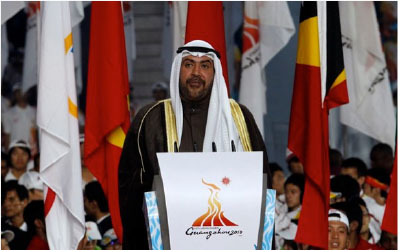 Tokyo will have a new governor next week following Sunday's gubernatorial election, but whoever the winner may be, Sheikh Ahmad does not believe the outcome will impact the organization of the Games. "Usually, the commitment before the Games should be given by the city, the government and the NOC of course," he said. "For that, I think any new mayor or governor that will come, he will respect all the commitments by the former leadership of his cities." "I hope he follows -- traditionally they follow." The Sheikh also said the dates for Tokyo's second Olympics ought to be kept flexible, to accommodate the city's summer which is increasingly becoming hotter. "The coordination committee will choose to propose to us the best environment for the Games. Remember in Sydney, we had the Games in September at that time." "If the time is in the benefit of the Games and the (International Federation) calendar matches, why not?"